For patients requiring cardiac rehabilitation or heart failure management, a comprehensive assessment is fundamental to developing a management plan. A thorough multidisciplinary assessment helps identify an individual’s risk of deterioration or decompensation; any changes in their conditioning as well as their capacity to self- manage. Essential elements of assessment are described below. Medical and surgical history should include the main complaint, current problems and any previous illnesses and operations, as summarised below. All health professionals involved in the patient’s care should also be identified. Social activity: Is the person socially active or isolated; what are the family relationships and support networks? Psychological conditions: Depression and anxiety are common in patients with cardiac disease, with a causal relationship between depression and social isolation and heart disease. Those treated with selective serotonin reuptake inhibitors (SSRIs) may require sodium monitoring as these medications can cause hyponatraemia. Depression screening should be routine. See Psychosocial issues for patients requiring more in-depth assessment. See Medication history and review for more information. A number of pathology and imaging techniques are used to clarify diagnosis, aetiology and response to treatment and will guide the management approach. See Investigations for cardiac disease for more detail. For patients with HF, intensive management should be prioritised for those at moderate to high risk of decompensation, or who have newly diagnosed systolic dysfunction. The table below offers guidance on how to judge the risk of decompensation or readmission to hospital for these patients. These factors should be noted during assessment and used to guide the planning and timing of intervention. The patient should be observed to gain an impression about obvious issues. Check to see whether the patient looks unwell, including facial expressions, general movement, obvious respiratory distress, body composition, skin colour, warmth and coolness of the peripheries, odour and voice. Orthostatic hypotension (or postural hypotension) is low BP that occurs when standing up from a sitting or lying position and is defined as a drop in SBP by at least 20mmHg or DBP by at least 10mmHg. Orthostatic hypotension can cause dizziness or light headedness, and may even result in fainting. It is often mild, lasting a few seconds to a few minutes after standing. However, long-lasting orthostatic hypotension can be a sign of more-serious problems which requires further investigation. Clinical reasoning should be applied to determine the most appropriate course of action for symptom management. Some symptoms may require urgent medical review, whilst others may be usual for the individual and can be safely self-managed. The presence of angina or non-ischaemic chest pain varies significantly from individual to individual. Assessment should therefore identify if medical review or further investigations are warranted and if this is urgently required. See Warning signs of heart attack patient fact sheet. Not all patients experience symptoms of angina. Patients with diabetes are more likely to experience minimal or no symptoms of chest pain, leading to silent ischaemia. Palpitations are caused by multiple factors and may be benign, but in individuals with cardiac disease, they may be indicative of a cardiac dysrhythmia such as atrial fibrillation (AF). Establish what action the patient takes to manage the symptoms and if there is an action plan. There are many cardiac and non-cardiac causes of breathlessness and assessment should aim to identify where further investigations or medical intervention is required. Does breathlessness occur at rest or on exertion and describe the activities? Does it occur only when experiencing chest discomfort? Is orthopnoea (breathlessness when lying flat) or paroxysmal nocturnal dyspnoea (waking at night with breathlessness) present? Nutrition assessment of patients with HF can be challenging as weight loss may be masked by fluid retention. Use dry weight when assessing weight loss. Despite these difficulties, it is important to routinely screen all HF patients, inclusive of overweight/obese patients, for malnutrition risk using the Malnutrition Screening Tool (MST) [#ferguson-m-capra-s-bauer-j-et-al.-1999] (see table below). Patients with an MST score of 2 or more should be referred to the Dietitian for further assessment, if available. If yes, how much weight has been lost? 2. Has the patient been eating poorly because of a decreased appetite? Oedema may be caused by multiple factors such as HF, musculoskeletal disorders, gout, saphenous vein harvesting for CABG (leading to lower limb oedema on the side of the graft); and medications such as calcium channel blockers. Observe the presence of oedema and apply gentle pressure on the affected areas, noting the location and whether there is pitting. 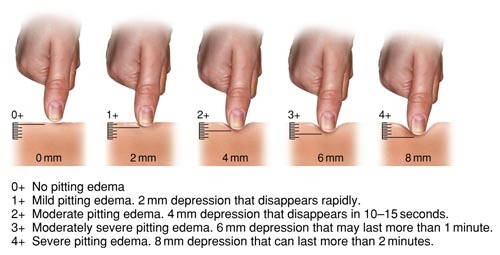 Rate oedema severity by pressing down firmly to the bone and releasing. Also assess the extent of pitting and how long it takes for the indentation to return to normal. *The online resource from the University of California San Diego provides in-depth instructions on performing a cardiovascular examination. These may be the consequence of the condition itself (e.g., low cardiac output state or cardiac rhythm disturbances), medication related, or due to fluid retention. Frailty is a state where physiological reserves are reduced, impairing responses to stressors [#clegg-a-young-j-iliffe-s-et-al.-frailty-in-elderly-people.-lancet.-20133819]. It is common in people with cardiovascular disease and is present in almost half of people with heart failure. Frailty is a strong predictor of outcomes independent of age and NHYA classification [#denfeld-qe-winters-stone-k-mudd-jo-et-al.-the-prevalence-of-frailty-in-hear] and severity of frailty is associated with higher rates of dependency, healthcare utilisation and mortality. Frailty phenotype [#fried-lp-tangen-cm-walston-j-et-al.-2001] Identifies frailty using 5 criteria which include: unintentional weight loss, self reported exhaustion, slow gait speed, low energy expenditure, weak grip strength. *Clinical frailty scale [#rockwood-k-song-x-macknight-c-et-al] Uses clinical descriptors and pictographs to stratify people into 9 levels of vulnerability. Rockwood K, Song X, MacKnight C, et al. A global clinical measure of fitness and frailty in elderly people. CMAJ. 2005; 173(5): 489–495.